Is application of Kinesio tape to treat hyperlordosis more effective on abdominal muscles or hamstrings? Background: Hyperlordosis is defined as an abnormal increase in the lumbar arch of >40°. 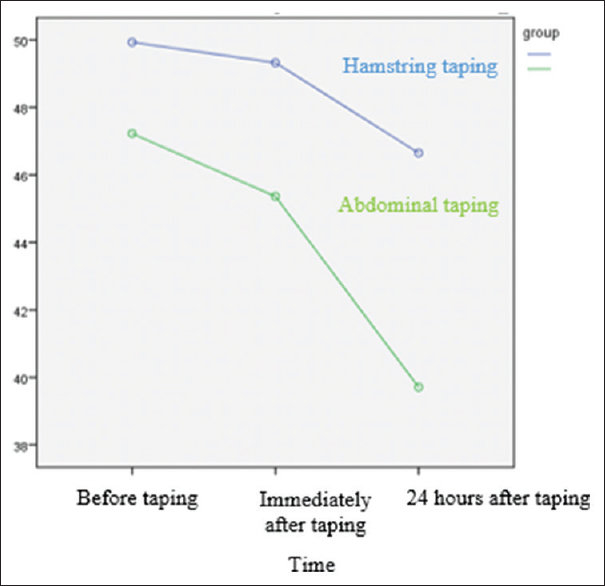 This study compared two taping techniques include abdominal muscles and hamstrings taping for the treatment of lumbar hyperlordosis. Materials and Methods: The randomized clinical trial was performed in Shiraz, Iran, during June and September 2014. Thirty women aged 20–45 years old with at least 40° lumbar lordosis participated. The women were randomized into two groups (n = 15). Abdominal muscles taping was performed for the first group, whereas the other group underwent hamstrings taping with 30% tension. Lumbar lordosis was measured before, immediately after, and 24 h after taping. The two-way repeated measures analysis of variance was used to compare the two groups for lumbar lordosis angle. Results: No significant differences were detected between the lumbar lordosis angles before and immediately after taping in the two groups (P > 0.05). However, a significant reduction was observed in lordosis angle in the abdominal group and the hamstring group 24 h after taping relative to before intervention (P < 0.01). Conclusion: Taping of the abdominal and hamstring muscles was not effective immediately, whereas it decreased lordosis after 24 h.
The vertebral column is the main axis in the human body and plays an important role in maintaining an upright posture. One of the most important postural deformities of the spinal column is lumbar lordosis. There are several reasons for lumbar hyperlordosis such as abdominal muscle weakness with shortening of hip flexors and back extensors, excessive weight or pregnancy, compensatory mechanisms for adaptation with other deformities, spondylolisthesis, bilateral congenital dislocation of the hip, and wearing high-heeled shoes. Currently, several treatments are used for the improvement of hyperlordosis including lumbar vertebral mobilization, strengthening of abdominal, hamstring, gluteal and postural control muscles, prescription of low-heeled shoes, and Pilates exercise. So far, a great deal of research has been conducted on the effectiveness of taping in musculoskeletal disorders. For instance, the effects of Kinesio tape on the improvement of chronic low back pain and anterior pelvic tilt angle have been reported. According to Lee and Yoo, immediately after taping of the internal oblique and erector spine both pelvic inclinations increased anteriorly. Taping could be used for pain relief, lumbar muscle function normalization, and reduction of initiation times of transverse abdominis and external oblique muscles contraction. Furthermore, application of Kinesio tape could increase straight leg raising and the popliteal angle. Moreover, application of Kinesio tape was efficient in pain reduction and improving isokinetic quadriceps torque in patients with knee osteoarthritis. Furthermore, peak force increased immediately and 48 h after application of Kinesio tape on gastrocnemius muscle in healthy participants. To date, the effects of taping on hyperlordosis remain unclear because of the limited number studies. Therefore, the present study aimed to compare the efficacy of Kinesio tape applied to abdominal muscles and hamstrings on the reduction of hyperlordosis. 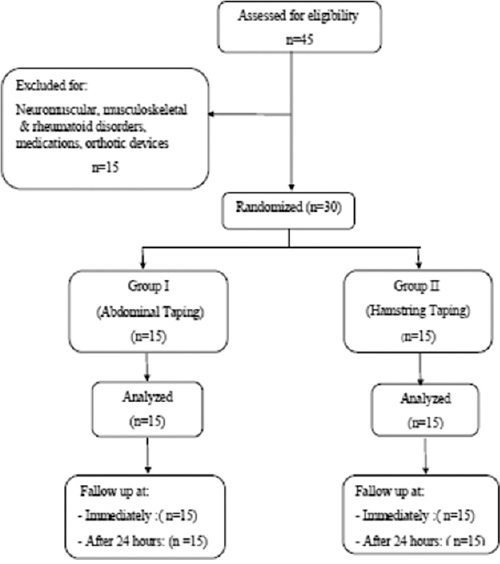 A double-blind, randomized clinical trial with concealed allocation was performed in Shiraz, Iran, during June and September 2014 and conducted on females with at least 40° of hyperlordosis (IRCT2014020916532N1). The sample size estimation was calculated with power 80%, and then thirty participants were selected through convenience sampling. In this study, participants aged between 20 and 45 years old were included in the study. Participants were excluded if they have any history of known neuromuscular, rheumatoid, or other diseases that affecting the musculoskeletal system, use of medication, and orthotic devices for treatment of hyperlordosis. After filling out a consent form, the participant enrolled in the research. This form was approved by Ethics Committee (CT-p-92-5573). Before, immediately after, and 24 h after the intervention,, a flexi ruler, as a non-invasive method, was used for determining the amount of lumbar curvature. This 60 cm ruler is made of special steel covered with plastic. It can be bent to fit the lumbar curve and retains its shape. The reliability and validity of this instrument have been previously demonstrated. The assessment was performed by an assessor blinded to intervention allocation of patients. To measure the lumbar curve, the patients stood with knees extended, feet approximately shoulder-width apart and then the lordosis was measured between the L1-S2 prominences. At first, the bilateral posterior superior iliac spine was detected, and their midpoint was considered as S2. For determining L1, the top of the iliac crest was found for the level of L5 spinous process. Then, the examiner counted up from this point and L1 was marked. Afterward, in a comfortable standing position, the patients looked forward, and the flexi ruler was placed along L1-S2 and equal pressure was applied to it until it resembled the lumbar lordosis. Then, the ruler's shape was plotted on paper. The angle between L1 and S2 was named Ө angle and calculated using the following formula: Ө=4[Arc tan (2H/L)]. The line L was formed by connecting the two ends of this curve. The maximum distance between L and the curve was labeled as the H line. According to previous studies, the normal lordosis angle is 30° and angles >40° are considered as hyperlordosis. After measuring the lumbar curve, the participants were randomly assigned to two groups. Abdominal muscle taping was applied for the first group, whereas the other groups underwent hamstring taping. The tape used in this study was adhesive with a width of 5 cm and thickness of 0.5 mm (Towatek Korea Co., Ltd.). In abdominal group, taping of the abdominal muscles was performed. For taping of the rectus abdominus muscles, all of the participants were asked to assume a crook-lying position with flexed knees and flat feet. Then, two I-strips of Kinesio tape were applied over the symphysis pubis to the xiphoid process with a longitudinal elasticity of 30% [Figure 1]a. For the external oblique muscles, one I-strip was placed over the inguinal area to the spinous process of T12 with a longitudinal elasticity of 30% in a side-lying position [Figure 1]b. In hamstring group, taping was applied to the hamstring muscles. For the biceps femoris muscles, in standing position, the patient was asked to bend forward until the hip was flexed and to extend their knees maximally. Then, two I-stripes were placed over the left and right biceps femoris muscles from the origin to insertion with a longitudinal elasticity of 30% [Figure 1]c. For taping of the semimembranosus muscles, the tape was applied in a standing position over the ischial tuberosity to insertion of the pes anserinus muscles with a longitudinal elasticity of 30% [Figure 1]d. Before, immediately after, and 24 h after the intervention, lumbar curvature was evaluated. Participants' consort flow diagram is showed in [Figure 2]. Statistical analyses were done with the Statistical Package for the Social Sciences version 19 software (IBM SPSS, Armonk, NY, USA) and P < 0.05 was considered as the significance level. Normality of distribution of data was checked by Kolmogorov–Smirnov test. The baseline characteristics were tested with independent t-test for checking the matching. Between- and within-group comparisons were made using two-way repeated measures analysis of variance (RM-ANOVA) to determine the effect of time and group and the interaction of them on the measurements. Post hoc analysis was done using with the Bonferroni's test. Thirty women with aged between 20 and 34 years old and lordosis angle between 40° and 60° were enrolled in this study. No significant differences were seen between the groups with respect to age, body mass index, and lordosis angle (P > 0.05). In each group, hyperlordosis was compared before, immediately after, and 24 h after taping. The two-way RM-ANOVA showed a significant main effect of group (F1,56=8.16, P = 0.008), a main effect of time (F2,56=24.694, P < 0.001), and interaction between the time of assessment and the treatment group (F2,56=3.642, P = 0.033) [Figure 3]. The post hoc analysis (Bonferroni's test) revealed no statistically significant difference between hyperlordosis before and immediately after taping in the two groups (P > 0.05). The comparison of lordosis before and 24 h after application of taping showed a significant decrease in both groups (P >0.01). The study results revealed a statistically significant difference between lordosis immediately and 24 h after taping within each group (P< 0.01) [Table 1]. The results also demonstrated a significant difference between the two groups before and 24 h after taping. The mean lordosis difference in abdominal taping group was more than hamstring taping group. That is the lumbar lordosis reduced more after 24 h of abdominal muscle taping compared to hamstring muscle taping (P = 0.02) [Table 2]. The purpose of this study was to compare the effects of abdominal and hamstring muscles taping on reducing hyperlordosis. The results showed no significant difference in the two groups before and immediately after taping. Our finding was similar to that obtained by Yoshida and Kahanov showing that taping did not immediately affect trunk extension and lateral flexion. Moreover, some studies revealed that taping did not alter neuromuscular function of femoral quadriceps in Anterior cruciate ligament reconstruction, jumping performance benefits, and knee extension force in elite athletes.,, In addition, applying of Kinesio tape immediately before squat exercise has no effect on muscle pain. Furthermore, application of Kinesio tape did not immediately influence the resting bioelectric activity of upper trapezius muscle in patients with latent trigger points. Our result may be due to the small sample size or due to the fact that the tactile inputs generated by Kinesio taping might not have been strong enough for short-term stimulations. Conversely, this is disagreed with the results of previous studies., It may also be a result of the taping techniques used. However, 24 h after application of Kinesio tape, a significant reduction of lordosis was revealed in both groups. This result agrees with the previous researcher. This finding can be explained by two theories. The first is that Kinesio tape increases peripheral blood circulation and lymphatic drainage due to lifting effects at the taped area. After application of Kinesio tape, autonomic nervous system stimulates, and vasodilation of the blood vessels occurs in the taped area. It can result in improved muscle function due to physiological changes.,, The other theory refers to the role of Kinesio tape in stimulating the cutaneous mechanoreceptors by pressure to them. Slow adapting Type 2 mechanoreceptors locate deep in the dermis, and this activation stimulates modulatory mechanisms in the central nervous system. In the other words, stimulation of skin mechanoreceptors promotes muscle spindle reflex contraction and excitability of motor units. Overall, taping is a useful method for improving the sensory input. When the body moves in an undesirable direction, tension increases in the tape and creates a deformation of the skin. Then, this procedure produces a large amount of sensory input that can improve the muscular function and the incorrect movement pattern can be controlled. Furthermore, taping can influence on the elastic and dynamic components of muscle. There can be a shift of the length-tension curve to the left and right. Taping can shift the length-tension curve to the left and optimize actin-myosin overlap during the cross-bridge cycle, while shifting of this curve to the right decreases actin-myosin overlapping, eventually affecting the muscles' strength. In the other, word Kinesio tape with normalizing of muscles tone increases the strength of concentric and isometric contraction. The results of the current study showed that lumbar lordosis reduced more after 24 h of abdominal muscle taping compared to hamstring muscle taping. There are two pairs of forces in lumbopelvic area that consist of four muscle groups. One of the pairs consists of abdominal muscles in the front and the hip extensors posteriorly whose simultaneous contractions reduce the lumbar lordosis angle. In contrast, the other pairs of forces comprise the hip joint flexors (in front) and the back extensors (behind). Simultaneous contractions of these muscles lead to anterior pelvic tilt followed by the enhancement of lumbar lordosis. According to a previous study, hyperlordosis is often accompanied by abdominal muscle weakness, whereas hamstring weakness exists less frequently. Application of Kinesio tape on the rectus abdominis muscles reduced lumbar lordosis because these muscles originate from the symphysis pubis and are inserted on the xiphoid process of the sternum and cartilages of the 5th to 7th ribs. In addition, lateral fibers of the external oblique muscles flex the spinal column and cause a posterior tilt of the pelvis. A few limitations of this research should be taken into account. First, the participants in this study were women, so we cannot generalize our results to men. We suggest further research in larger groups including both genders. Other study limitations included the short duration of taping, few repetitions of taping, and not measuring proprioception. To evaluate the effects of taping on muscle function, muscle strength should be measured before and after taping. Subsequent studies are required to be performed on the influence of Kinesio taping application on different lordosis angles. The long-term effects of Kinesio taping should also be investigated. Application of Kinesio tape on the abdominal muscles and hamstrings could reduce hyperlordosis in females after 24 h. This reduction was more significant after taping of the abdominal muscles. This study was based on work done for the thesis by Seydeh Mahshid Alavi and Fahimeh Freiydoon Nezhad, both of whom were supported by Shiraz University of Medical Sciences, Shiraz, Iran. The authors gratefully acknowledge the Faculty of Rehabilitation Sciences of Shiraz University of Medical Sciences, for their scientific and financial support of this study. We also thank Pamela Waltl (AuthorAID in the Eastern Mediterranean) for improving the use of English in the manuscript. Brody LT, Hall CM. Therapeutic Exercise: Moving Toward Function. 3rd ed. Baltimore: Wolters Kluwer/Lippincott Williams & Wilkins Health; 2011. p. 193. Magee DJ. Orthopedic Physical Assessment. 6th ed. St. Louis: Elsevier Health Sciences; 2014. p. 560. Kim TW, Kim YW. Effects of abdominal drawing-in during prone hip extension on the muscle activities of the hamstring, gluteus maximus, and lumbar erector spinae in subjects with lumbar hyperlordosis. J Physiol Anthropol 2015;27:383-6. Dai M, Li X, Zhou X, Hu Y, Luo Q, Zhou S, et al. High-heeled-related alterations in the static sagittal profile of the spino-pelvic structure in young women. Eur Spine J 2015;24:1274-81. Mahdavinejad R, Rezaei SS. Pilate's selected exercises effects on women's lumbar hyperlordosis in immediate post-partum period. Asian J Multidiscip Stud 2014;2:48-53. Lee JH, Yoo WG. Application of posterior pelvic tilt taping for the treatment of chronic low back pain with sacroiliac joint dysfunction and increased sacral horizontal angle. Phys Ther Sport 2012;13:279-85. Grześkowiak M, Szulc P, Szwedziak M, Lewandowski J. The effect of the kinesio taping method on spinal motion and physiological spinal curvatures. Literature review. Ortop Traumatol Rehabil 2014;16:221-6. Lee JH, Yoo WG. The mechanical effect of anterior pelvic tilt taping on slump sitting by seated workers. Ind Health 2011;49:403-9. Bae SH, Lee JH, Oh KA, Kim KY. The effects of kinesio taping on potential in chronic low back pain patients anticipatory postural control and cerebral cortex. J Phys Ther Sci 2013;25:1367-71. German R. Inhibitory Kinesio® Tape Application to the Hamstring Muscle Group: An Investigation of Active Range of Motion and Perceived Tightness Over Time: Kent State University; 2013. Anandkumar S, Sudarshan S, Nagpal P. Efficacy of kinesio taping on isokinetic quadriceps torque in knee osteoarthritis: A double blinded randomized controlled study. Physiother Theory Pract 2014;30:375-83. Lumbroso D, Ziv E, Vered E, Kalichman L. The effect of kinesio tape application on hamstring and gastrocnemius muscles in healthy young adults. J Bodyw Mov Ther 2014;18:130-8. Habibi A, Sahebozamani M, Yekta YZ, Valizadeh R. Comparison powers of couple force of anterior & posterior rotator's muscles in Hyperlordosis and healthy male. Procedia Soc Behav Sci 2011;15:2342-6.
de Hoyo M, Álvarez-Mesa A, Sañudo B, Carrasco L, Domínguez S. Immediate effect of kinesio taping on muscle response in young elite soccer players. J Sport Rehabil 2013;22:53-8. Seidi F, Rajabi R, Ebrahimi T, Tavani A, Moussavi S. The Iranian flexible ruler reliability and validity in lumbar lordosis measurement. World J Sport Sci 2009;2:95-9. Yousefi M, Ilbeigi S, Mehrshad N, Afzalpour ME, Naghibi SE. Comparing the validity of non-invasive methods in measuring thoracic kyphosis and lumbar lordosis. Zahedan J Res Med Sci 2012;14:37-42. Yoshida A, Kahanov L. The effect of kinesio taping on lower trunk range of motions. Res Sports Med 2007;15:103-12. Oliveira AK, Borges DT, Lins CA, Cavalcanti RL, Macedo LB, Brasileiro JS, et al. Immediate effects of kinesio taping(®) on neuromuscular performance of quadriceps and balance in individuals submitted to anterior cruciate ligament reconstruction: A randomized clinical trial. J Sci Med Sport 2016;19:2-6. Schiffer T, Möllinger A, Sperlich B, Memmert D. Kinesio taping and jump performance in elite female track and field athletes and jump performance in elite female track and field athletes. J Sport Rehabil 2015;24:47-50. Serra MV, Vieira ER, Brunt D, Goethel MF, Gonçalves M, Quemelo PR, et al. Kinesio taping effects on knee extension force among soccer players. Braz J Phys Ther 2015;19:152-8. Ozmen T, Aydogmus M, Dogan H, Acar D, Zoroglu T, Willems M, et al. The effect of kinesio taping on muscle pain, sprint performance, and flexibility in recovery from squat exercise in young adult women. J Sport Rehabil 2016;25:7-12. Halski T, Ptaszkowski K, Słupska L, Paprocka-Borowicz M, Dymarek R, Taradaj J, et al. Short-term effects of kinesio taping and cross taping application in the treatment of latent upper trapezius trigger points: A Prospective, single-blind, randomized, sham-controlled trial. Evid Based Complement Alternat Med 2015;2015:191925. Voglar M, Sarabon N. Kinesio taping in young healthy subjects does not affect postural reflex reactions and anticipatory postural adjustments of the trunk: A pilot study. J Sports Sci Med 2014;13:673-9. Lemos TV, Pereira KC, Protássio CC, Lucas LB, Matheus JP. The effect of kinesio taping on handgrip strength. J Phys Ther Sci 2015;27:567-70. Gómez-Soriano J, Abián-Vicén J, Aparicio-García C, Ruiz-Lázaro P, Simón-Martínez C, Bravo-Esteban E, et al. The effects of kinesio taping on muscle tone in healthy subjects: A double-blind, placebo-controlled crossover trial. Man Ther 2014;19:131-6. Álvarez-Álvarez S, José FG, Rodríguez-Fernández AL, Güeita-Rodríguez J, Waller BJ. Effects of kinesio® tape in low back muscle fatigue: Randomized, controlled, doubled-blinded clinical trial on healthy subjects. J Back Musculoskelet Rehabil 2014;27:203-12. Csapo R, Alegre LM. Effects of kinesio(®) taping on skeletal muscle strength-A meta-analysis of current evidence. J Sci Med Sport 2015;18:450-6. Yeung SS, Yeung EW. Acute effects of kinesio taping on knee extensor peak torque and stretch reflex in healthy adults. Medicine (Baltimore) 2016;95:e2615. Hertling D, Kessler RM. Management of Common Musculoskeletal Disorders: Physical Therapy Principles and Methods. 4th ed. Philadelphia: Lippincott Williams & Wilkins; 2006. p. 153-4. Kendall FP, McCreary EK, Kendall HO. Muscles, Testing and Function: Testing and Function. 3rd ed. Baltimore: Lippincott Williams and Wilkins; 1983. p. 218-9.